DONETSK, Ukraine -- Ukrainian authorities say that pro-Russian gunman have seized government buildings in two major cities the eastern part of that country in the latest case of unrest that the interim Ukrainian government believes is being fueled by Moscow. 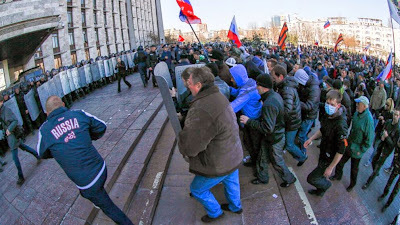 Pro-Russian activists prepare to clash with police at the regional administration building in Donetsk, Ukraine, Sunday, April 6, 2014. Speaking at an emergency Cabinet meeting, Prime Minister Arseniy Yatsenyuk said Russia's plan was "to destabilize the situation, the plan is for foreign troops to cross the border and seize the country's territory, which we will not allow." Yatsenyuk also claimed that people engaged in the unrest have distinct Russian accents. Yatsenyuk said Russian troops remain stationed within 19 miles of the frontier. Sky News reported that dozens of people armed with sticks and rocks broke through police lines during a pro-Russian rally and surged into a regional government office in Donetsk, roughly 50 miles west of the Russian border. Some of the protesters were chanting "Donetsk is a Russian city" as they climbed to the roof, where they waved the Russian flag. They then threw firecrackers at around 200 police officers surrounding the building. Local media reported that groups occupying the provincial government building have barricaded the entrance with car tires and barbed wire. The Associated Press reported Monday that gunmen had occupied the local headquarters of the security services in the eastern city of Luhansk, only 15 miles west of the border. Police in Luhansk said they have been put on alert and have blocked all entrances to the city. The unrest comes after a crowd of pro-Russian activists stormed the security services building on Sunday. Local media reported that demonstrators pelted the building with eggs, and then stones, a smoke grenade and finally a firebomb. The flames reportedly were quickly extinguished. Provincial government buildings were also briefly seized Sunday in Kharkhiv, Ukraine's second-largest city. However, Ukraine Interior Minister Arsen Avakov said Monday that the Kharkiv building had been retaken by the authorities. Several cities in the east of Ukraine have witnessed demonstrations since pro-Russia president Viktor Yanukovych was deposed and fled the country in February. The subsequent annexation of the Black Sea region of Crimea by Russia has only whetted the appetite of the ethnic Russians in Ukraine's east for a similar fate. On Sunday in Donetsk, approximately 2,000 people waved Russian flags and shouted "Give us a referendum" and "NATO go home." The demonstrators were agitating for the release of 15 pro-Russian activists accused by police of attempting to seize the city's administration building through use of "arms and explosives." Elsewhere, Russian news agencies reported Monday that prosecutors have opened a criminal investigation into the death of a Crimea-based Ukrainian army major, who was shot and killed by a Russian soldier on Sunday. Russian reports said a group of Ukrainian soldiers in the village of Novofedorovskoye had been drinking and were on their way home when they passed Russian soldiers guarding an entry to the military base where they previously worked, and an argument kicked off between the two groups.